Now who's interested in winter camping? This front country lodge is located in Spray Valley Provincial Park on the Spray Lakes Road outside of Canmore. The Spray Lakes Road turns into the Smith Dorrien/Spray Trail (highway 742 south) and the Lodge is located beside the road to the Mount Shark trailhead past the Spray Lakes Reservoir. While the lodge is considered "front country" due to its drive-up approach, you will definitely get a backcountry experience as you stay in this remote setting for a night or two. For more information on the location and how to reach the lodge, visit their website for driving instructions. Accommodation at Mount Engadine comes in various options depending on your budget. The lodge suites overlook the meadow are ideal for families wanting to stay at Mount Engadine. Well-behaved pets are even welcome in some rooms at the lodge so you won't be stuck finding a dog-sitter during your stay. The second option available for families is the Meadows Edge Chalet on the Mount Engadine property. The chalet has three separate rooms in the cabin, each with private bathrooms and showers. My favourite, the Whiskey Jack room has two bedrooms (one with a queen bed and the other with twin beds) and its own private deck. The third option for families at Mount Engadine is the yurt where we recently stayed. This is by far the cheapest option at $125 per person for a night (including all meals at the lodge.) Families wanting to stay without meals can rent the yurt for $50 per night and treat it as more of a real camping experience. Children receive a discounted rate and the yurt sleeps four people. All stays at Mount Engadine include afternoon tea (coffee, tea, charcuterie board, pastries, apple strudel on Sundays,) a three-course dinner with soup or salad, main course, and dessert, breakfast the next day, and a packed lunch for your adventures. And lest you worry about the "quality" of your food during your stay, this is 5-star dining at it's finest! Chef Gerard Garnier serves up gourmet meals that could include Eggs Benedict with smoked bacon for breakfast along with slow cooked bison ribs or rack of lamb for dinner. Even the sandwiches for lunch taste better than anything I could prepare myself with fresh baked bread and homemade cookies to take on the trail. Afternoon tea is available for visitors to the lodge every day between 2 and 5pm without a reservation if you just want to pop in after hiking or skiing in the Spray Lakes area. More information on the cost and on what's included is here at Afternoon Tea at Mount Engadine Lodge. Dinner reservations can also be made if you just want to drop by for dinner without spending the night. Information on making reservations for dinner can be found on the website. 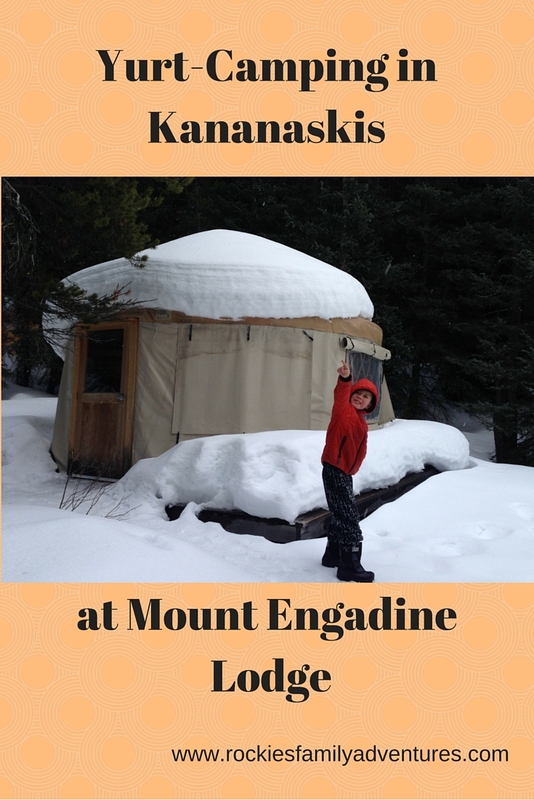 As I mentioned earlier, we recently stayed in the yurt at Mount Engadine Lodge for a night. We spent the day skiing at nearby Chester Lake and then checked in with plenty of time to enjoy afternoon tea. We spent the rest of the afternoon reading and playing games by the fireplace and enjoyed a fabulous gourmet dinner. After dinner we retreated to our cozy yurt and crawled into our sleeping bags for the night. We woke up the next morning and returned to the lodge for our breakfast with the other guests. We placed our lunch orders, spent some more time hanging out by the fireplace, and then left for our day's adventures. The yurt is primarily advertised for use during the spring, summer, and fall seasons, but if you are willing to "rough it" a little bit, you are more than welcome to make a reservation during the winter months as we did. The only request is that you bring your own sleeping bags if staying in the off-season. During the summer months, bedding is provided for you in the yurt and it's more of a "glamping" experience. We certainly didn't mind bringing our own sleeping bags and we were never cold in the yurt while sleeping. We didn't make use of the propane heater at night but it was there should we have wanted. We also had a fire pit located outside our little cabin which would be fun to sit around before bed. To make a reservation at Mount Engadine Lodge, visit the Mount Engadine Lodge website. Big thanks to Mount Engadine Lodge for accommodating our stay in the yurt for the night. As always, all words are my own and I wasn't paid to write this story.